You want to start fresh, and getting rid of anything that you don’t use anymore or that takes away from the beauty of the entryway is imperative to a redesign. If you have a front closet, free up space by putting out-of-season coats and shoes away in storage. This will free up space without cluttering up your bedroom closets or floors. Your front door is perhaps the most important part of your entryway, given that it makes the first impression. If your door’s been through the ringer over the years, it is probably in need of repair. You can do a lot to improve the look of your door — a fresh coat of paint, new hardware, new window coverings and the like. It just depends on how much money you want to spend. Just make sure you don’t paint the inner part of the door a strangely different color than the exterior (ex. bright green on the interior, black on the exterior). Why not wow people when they walk through your door? Use a sculpture, a piece of art, the staircase leading up to the second floor to create a focal point — whatever you think merits the most attention. There are many options to choose from, whether you want to accent something in your home or buy a new piece from a secondhand store or art gallery. Color-coordinated hooks and bins for everyone’s stuff — coats, shoes, backpacks, etc. Don’t feel cramped by square footage or existing furniture. There are plenty of options available for someone with a small budget or space. If you have little square footage in your entryway, use the walls for storage. Hooks, hanging bins, wall-mounted cubbies — there are plenty of ways to store items in your entryway without taking up floor space. It doesn’t have to look like a second closet or a locker, as long as you design efficiently. You can get most of these items from a local home improvement store, but you can also have cubbies or wall-mounted shelves designed by a carpenter if you need them to meet certain dimensions. If your entryway is lit only by natural light coming in through the front door windows, add some other light fixtures. Hanging lamps, candles, recessed lighting — choose the best lighting fixture based on the design of the room. Floor lamps might be a good option if you have the space, or you might consider a lamp that sits on a table in the room and flips on at night with a timer. You can even add a mirror to help reflect the light and brighten the space even more. Entryway design can be easy, quick and cheap, depending on what you want to do with the space. If you are a family busy with school, sports and other activities, you might need to gear the entryway towards cutting down on stress in the morning (for info on how to do that, check out this article). 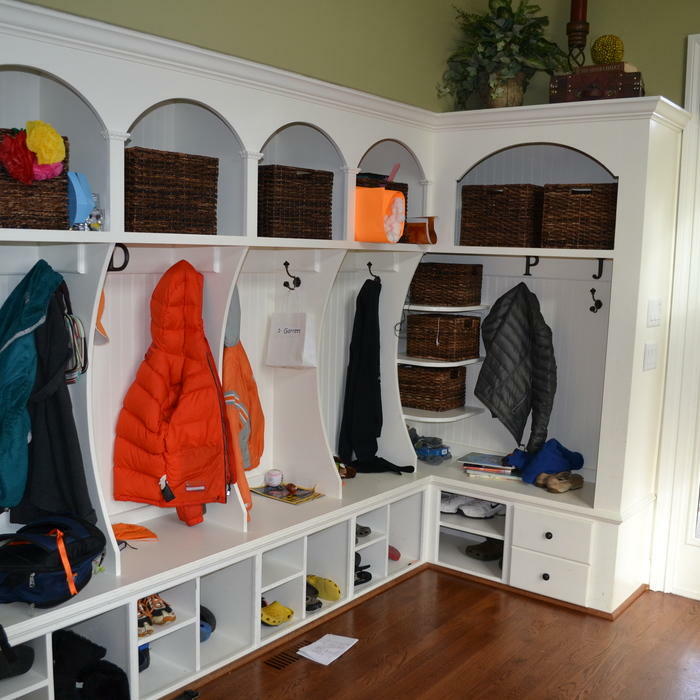 Whatever your lifestyle, use your entryway to help you stay organized and efficient.